Updated Monday July 10, 2017 by Stanley Park Optimist Club. Photo: Top place in 2017, and a cheque for $2,000, went to John Oliver for his 20 1/32" smallmouth bass. 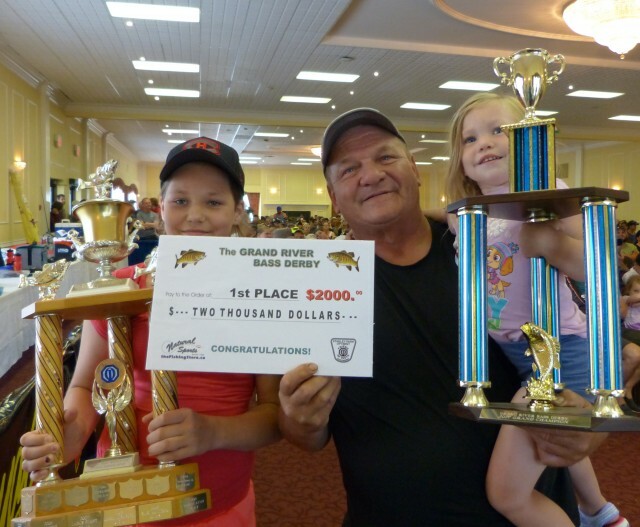 John is shown here with two of his grandchildren and the first place trophies. Congratulations! The Grand River Bass Derby (held July 8 and 9, 2017) is one of the largest and longest-running bass derbies in Canada. The derby attracts hundreds of people from Southwestern Ontario to fish the Canadian Heritage River and enjoy some fantastic smallmouth bass fishing. Prizes are awarded for the longest fish brought in alive as well as specially tagged fish. All entrants are also eligible for the Grand Draw Prize and hundreds of other draw prizes contributed by local businesses. This year, the measuring station was manned at Natural Sports and was kept busy as 25 fish of 18+" were brought in along with numerous rock bass for the research work being conducted by Shayla Tuttle-Raycroft of the University of Guelph. The two tagged fish (worth $1,000 each) evaded capture this year. All in all, another very successful event and encouraging signs for the health and conditions of the of the Grand River watershed.